Learn about the vendors that were at our event, and what went on throughout the day. Check out this handy map (complete with market manager contact info) of our local area growers’ markets. The regular growers’ market season starts May 18, 2013. Thanks, AGMA! Learn about the benefits of shopping at growers’ markets and supporting sustainable, local agriculture. Learn about the vendors that were at our event, and how to find them at other Albuquerque area growers’ markets. 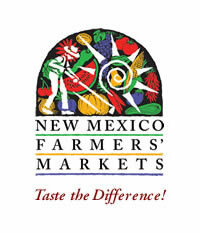 There are numerous restaurants in the Albuquerque area that serve locally-grown produce and locally-raised meats. Students in the SUST 364: Growers’ Market Practicum put together this handy booklet detailing restaurants that are in on the local food scene. Many of these restaurants are shown on the MRCOG Agriculture Collaborative’s local food map. Lobo Gardens provide UNM students, faculty and staff with opportunities to educate themselves about growing food in a sustainable manner. Lobo Gardens has recently formed a partnership with Chartwells Dining Services. As a part of the Extreme Local initiative, La Posada Dining Hall and the Chartwells Mercado (SUB Plaza Level) are now offering food items made with fresh Lobo Gardens produce. Look for the Extreme Local – Made Fresh with Lobo Gardens Produce stickers on special Chartwells Mercado Deli sandwiches. This is food grown by students for students! Ever wondered what to do with that beautiful bunch of kale or bag of eggplant? Check out these healthy and delicious kitchen-tested recipes that use local, seasonal produce…brought to you by UNM students in NUTR 322: Management in Dietetics II. Check out the UNM Area Guide to Sustainable Living, created by students in the Fall 2011 CRP 165: Introduction to Community & Regional Planning class.